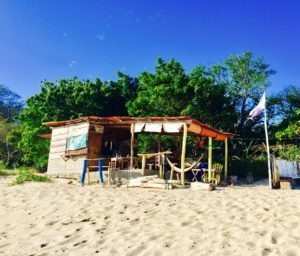 My article below recently appeared on Travel-About.com. I’d never been to Central America, but here I was at Pearson airport in Toronto one early morning in February looking for the Air Transat check-in desks. I was so excited, but a little nervous, to be heading to Nicaragua. I was aware it’s a developing country and even though friends who had visited last year told me it was indeed safe, I still worried a little. You know that feeling: fear of the unknown. Plus, I hadn’t had a coffee yet. Getting to the Air Transat desks, though, I was delighted to be able to use the fast-lane check-in afforded to Option Plus flyers (so my goal of a Grande Bold in the departure lounge would happen sooner rather than later). And I quickly came to the conclusion that the little extra cost of Option Plus was well worth it. There was free seat selection when I booked; no charge for my checked bag; priority baggage handling; and a free snack box on board, which consisted of high-quality treats such as gouda cheese biscuits, Greek olives, sea-salt pita chips and chocolate—all of which went well with the complimentary Bottega Gold prosecco (and additional complimentary glass of wine—why not? It was a 5-hour flight!). Plus, I was given a free headset for the in-flight entertainment, and a cozy blanket that came in a reusable cloth drawstringed bag. In short, I arrived in Nicaragua much more relaxed than when I got to the airport. And that feeling only got better as this beautiful country revealed itself to me and my traveling friends over the next week (I was joined by a good friend who lives in the U.S., plus two couples, close friends from Canada who flew separately). Our first digs was a rented villa just north of surf central, San Juan Del Sur. Villas Playa Maderas was wonderful, and we spent the first few days walking the excellent beach and cooling off in the infinity pool. And, yes, sampling the local rum, Flor de Cana, with ice and fresh lime juice. Mmmmm. The local “pub” was a short walk down the beach. After spending most of our week there, we parted ways with one couple, and the rest of us travelled up to historic Granada. I was amazed to learn that it’s the oldest colonial city in all of the Americas. It’s colourful and vibrant, if a little run-down in some parts. But regardless of where were explored on foot, we never felt unsafe or threatened in any way. People couldn’t be more helpful when we were lost and needed to be pointed in the right direction. We had excellent meals: one evening at El Zaguan steakhouse—that has a deserved reputation for delicious food, great service and excellent value (I had the steak with jalapeño cream sauce)—and the other at Espressionista , a special place where menu items are locally sourced, and where the flavours are diverse and superb. I had the Coconut Ceviche (featuring sour-orange infused mackerel) and the Ajo Blanco, a cold almond-milk soup with fresh watermelon, infused oils and garlic. Both were out of this world. The tranquil courtyard and pool at Tribal Hotel. Okay, I’ve saved the best for last in terms of the most superb experience while in Granada: Tribal Hotel. 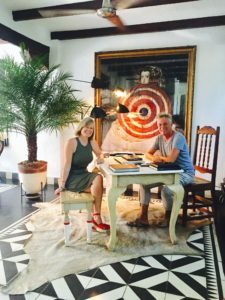 From the moment I arrived after a hot, dusty walk over cobbled streets pulling my wheeled suitcase, I was made to feel totally at home. As Byron checked me in, I was handed a cold towel scented with lemongrass—heavenly—and a glass of ice water. 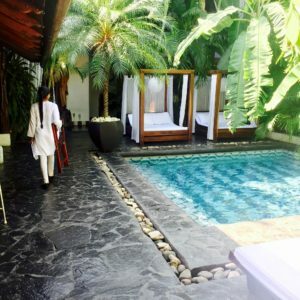 I was shown to my beautiful room and didn’t waste time changing into my swimsuit and getting into the inviting courtyard pool under a blue sky. From this vantage point, I soaked up my gorgeous surroundings. 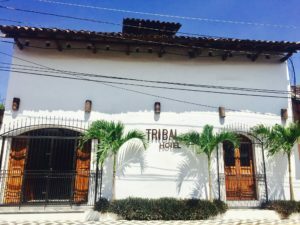 My gosh, the photos in this article and on Tribal’s website just do not do this place justice. There are only seven rooms, and each has its own outdoor curtained terrace facing the central courtyard, where there is a lovely pool surrounded by lush and non-manicured greenery, lending it a wild and welcoming vibe. Along one side are tables for breakfast, or, later, light snacks and drinks. The design aesthetic is a special combination of original colonial and modern. There’s artwork everywhere. It’s all in keeping with a, well, tribal feel. That’s me with Tribal Hotel co-owner Yvan Cussigh. These two know how to make a memorable experience. The beauty of my surroundings while staying there, the impeccable service, the comfort of the room—and not to mention the delicious, freshly cooked (and included) breakfast—made my stay here so special. 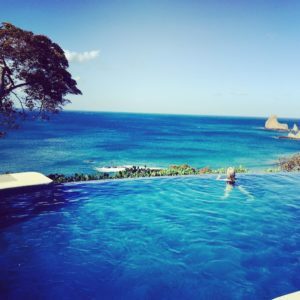 It capped off an excellent experience in a great new travel discovery: Nicaragua.